There is not a whole lot of specialized candle making equipment, but there are a few good things to have in your arsenal if you you're planning on making candles as a hobby. Here is a list of some of the best and most handy candle making equipment out there. Add these things to your wish list or get some of them for your favorite crafter. One of the most handy pieces of candle making equipment is a real double boiler. Sure, you could just use a large pot with a smaller pot on top of it, but having a real double boiler with pieces that fit together well is an inexpensive luxury for you or your favorite candle maker. For one thing, it's great to have pieces that are dedicated to candle making. If everyone knows this double boiler is only to be used for crafts, you don't have to worry about cleaning every little speck of wax out of the pot every time you use it, and no one will get confused and think it's a fine pan for warming up soup. Having a double boiler makes your candle making experience a lot safer. Heating your wax directly on the burner can cause it to get too hot, potentially causing a fire. That's not to say that you can't set wax on fire using a double boiler, but it is a lot more difficult. You'd probably have to wander away from your craft area for a long time in order to cause a messy accident. I'm not saying you should ever leave any sort of melting wax unattended, but if you did and you were using a double boiler, you'd be a lot safer than if you were melting right on the stove. My next-favorite piece of candle making equipment is my hot plate. You can buy a hot plate at just about any discount store, department store, or even grocery store, probably for $10 or less. A hot plate is just a burner that runs on electricity. It usually has a dial that lets you control the heat. It is ideal for candle making because you can use it anywhere. You don't even have to be tied to the kitchen if you don't want to (though the kitchen is usually the best place in the house to make candles because of all the clear counter space). Again, having a hot plate is as much a safety issue as it is an issue of convenience. It's harder (though still entirely possible) to get a hot plate so hot that it will set your wax on fire. If you do have a fire, spill, or other messy situation, it's a lot easier to clean up around a hot plate than it is your stove. I cover the whole work area with newspapers or a folding cardboard cutting mat (which you can find at a craft store in the fabric section) so I don't have to feel bad about making a mess. If your wax did boil over or you got your hot plate dirty, you could always toss it and buy a new one without much expense. The same can't be said if you ruin your stove! The two above-mentioned items are really the main specialized pieces of equipment you need in order to make candles. Of course, there are still a lot of supplies that you'll want and need to have on hand to make the best candles, namely, wax, wicks and molds. I put these all in the same category because there is always room for more. There are several different kinds of candle wax that can be fun to work with. While you'll probably start with the big bulk candle wax slabs that are available at your local craft store, you'll be doing yourself and your craft a disservice if you don't explore the wider world of wax. 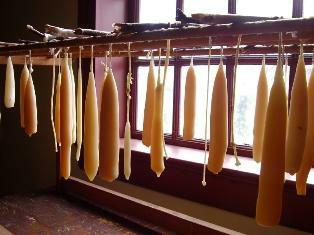 Check out bayberry, beeswax, palm wax and soy to name a few. You might also want to check out gel that is used to make candles. All these different materials can add new depth to your candle making experience. The kind of wick you will use depends entirely on the size of the candle you are making. Larger sized wicks are required for large candles to burn cleanly. Sometimes it can be hard to figure out what wick is ideal for the size of your candle. Further, there may only be one or two sizes of wick at your local craft store. A great way to find out what wick is right for you is to check out a website that sells several different kinds of wick. The information provided for each wick type says what diameter candle it is most suited to. The most fun candle making equipment is your mold collection, and you will only be limited by your budget and your room to store candle molds in. Almost anything that you could ever want to shape a candle like has been made into a mold; if you can't find what you're looking for you can probably find someone who will make one for you. Building up your candle mold stash does not have to break the bank. If you use a little creativity you can find mold material right in your own home. Build a square mold out of cardboard, or a pillar out of a soup can. Use interestingly shaped plastic bottles, chip cans, or whatever else you've got lying around. You can even use a bucket of firmly packed sand to make a candle. If something looks like it might make an interesting candle mold, try it out. The worst thing that can happen is you don't like the look or it is impractical. In that case, just melt the wax and try again!